FCI HP Watchman Admit Card 2018 : Food Corporation of India Himachal Pradesh has advertised the 40 watchman/security guard/watchman posts in the months of October and November 2017. Many of the aspirants seeking to get the watchman posts in FCI have applied for the announced posts during the scheduled application dates. The FCI is going to select the aspirants based on the performance of aspirants in various tests. Initially, the FCI is going to conduct the written test for the aspirants applied for Watchman/Chowkidar posts. Candidates going to appear for the examination have to download FCI HP Watchman Hall ticket 2018 to proceed with the examination. Candidates will not be allowed to the examination without showing the admit cards. 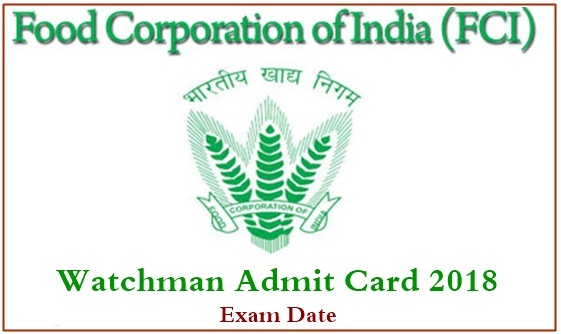 Hence aspirants must download FCI HP Watchman admit card before going to the examination and preserve It safe to show at the time of verification. Food Corporation of India Himachal Pradesh has advertised 40 watchman posts in 2017 and invited applications from eligible aspirants. Many of the hopefuls seeking to get FCI vacancies have applied for the watchman posts. Candidates will be shortlisted based on their performance in written test, physical fitness, and interview rounds. Candidates initially have to qualify the FCI written test to proceed for next rounds of selection process. Candidates have to qualify in various rounds to finally get shortlisted for the posts of security guard/watchman. Final selected candidates will get good pay scale as per norms. Aspirants applied for FCI Himachal Pradesh Watchman posts can download FCI HP Chowkidar admit card 2018 from the official portal, fcihpapply.com. The FCI hp Official Website is shortly going to announce the hall ticket release date. Aspirants applied for the posts can keep checking the official website, fcihpapply.com to check the hall ticket availability date. The website is displaying that hall ticket will be accessible before 15 days of the examination. Aspirants can keep visiting the portal on a frequent basis to download the hall ticket. Initially, the applicants have to appear for the written test conducted by FCI in May/June. The Examination will be held at various examination centres of Himachal Pradesh state. Since many of the hopefuls having the suitable qualification have applied for Watchman posts, the examination will be held in various examination centres across the state. All the applicants applied for FCI watchman will have to appear for the test on the announced date. Candidates can download FCI Chowkidar Hall ticket 2018 before 15 days of the examination (approximately). FCI Security guard Hall ticket 2018 and observe the details of their examination centre, date, and timings carefully from it. Also, aspirants must have to remember that, without admit cards, they will not be allowed to take the examination. Hence candidates must carry the admit cards while going to the exam. FCI watchman ka admit card kab tak release hoga. kindly reply sir. I shall be very thankful to you, if you reply my query.